This game has so much potential. It’s taken over as my favourite survival game (previously held by the Arma 2 mod version of DayZ, which I have brilliantly fond memories of (haven’t played the standalone release though)). 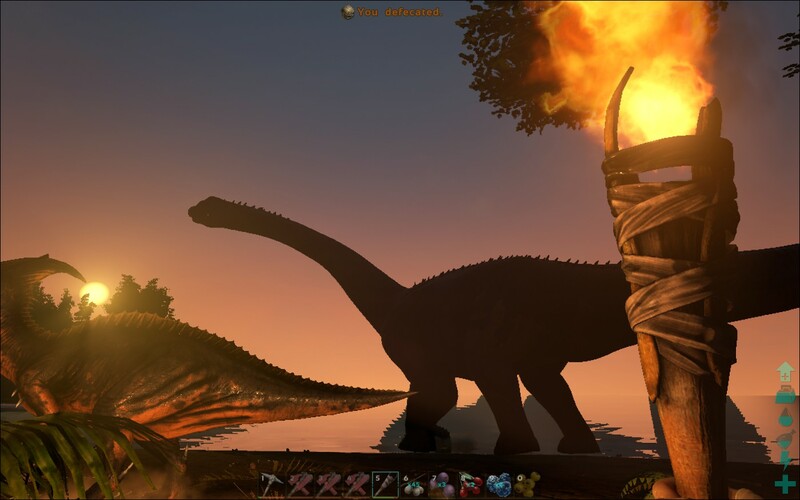 Take a huge tropical island setting, throw in over a hundred different types of animal and donosaurs, make them all tameable and add a good slice of base-building and you have Ark. It’s in Early Access on Steam right now, and is very playable. It’s also a bit of a graphics hog, which my nVidia 560 GTX can barely handle, but if you have something remotely newer, it’ll be fine. 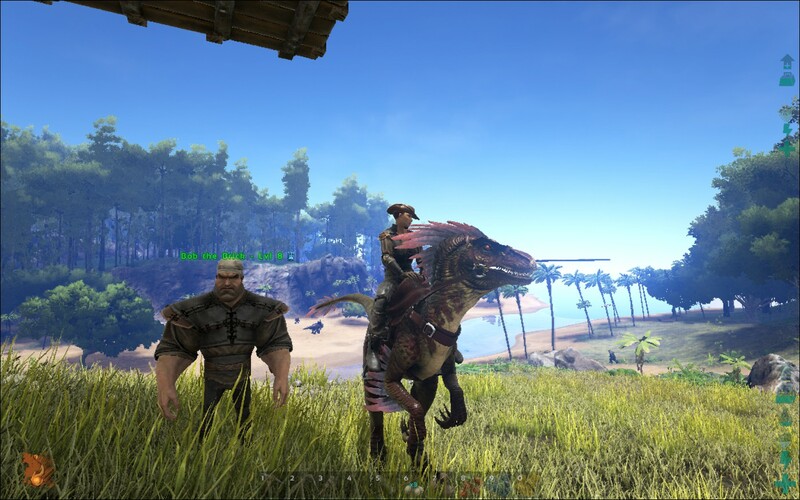 I’ve clocked about 20 hours so far and have managed to tame a Dodo, a Dilophosaurus, a Parasaur, a Phiomia and even a Raptor. All of them are dead now, however. I seem to be barely capable of keeping them alive, and it’s horribly frustrating. This game would be wonderful with a bunch of friends, as the numerous YouTube videos prove. Seriously, look it up and watch in awe at some of the tribes out there with their fully self-sustaining castles with fertilised greenhouses and huge dinosaur pens. It’s incredible. And with constant updates, its only getting better. My good friend Steve recently had a spot of luck when he noticed Gamespot selling the Pc version for a stupidly marked down price. He kindly bought me a copy and I’ve been playing it for the last 2 days. It starts out a bit linear, to get you used to the controls but it doesn’t take long before you’re thrown into a bigger hub area, and set loose. While its not an open-world game, its game world feels refreshingly big and begging to be explored. 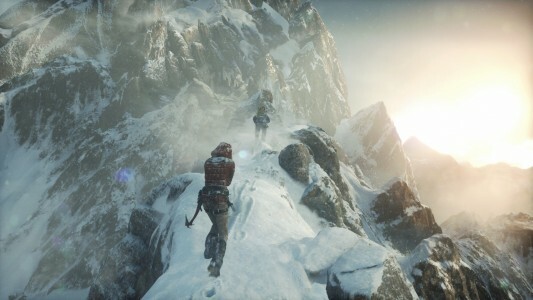 Lara Croft has never looked better, the graphics are stunning. She also looks more like a real person – gone are the days of her exaggeratedly gigantic breasts. She moves with intricately detailed animation and is voiced with charm and grace by Camilla Luddington. There’s animals to hunt, collectibles to find, puzzles to solve and yes, tombs to raid. The optional tombs are some of the best moments I’ve seen so far, requiring a bit of thought to solve and giving you a satisfying sense of accomplishment when you do. They also look really pretty. The only thing I’m finding a bit tedious is the hokey story. Something about an immortal prophet and some mystical mumbo jumbo. These games have always had that in them, and i’ve never really cared for it, but I don’t play these games for the story. I play them for the platforming, puzzle solving and environmental exploration. Very much enjoying this one so far. This entry was posted in Thoughts and tagged ark survival evolved, currently playing, rise of the tomb raider. Bookmark the permalink. healthy eating plus regular physical activity.